When Hannah Breed confides to midwife Rose Carroll that she's pregnant out of wedlock, Rose promises to help her through the pregnancy and figure out a way to break the news to her family. But that night, amid the noise and revelry of the Independence Day fireworks, Hannah is found shot dead. 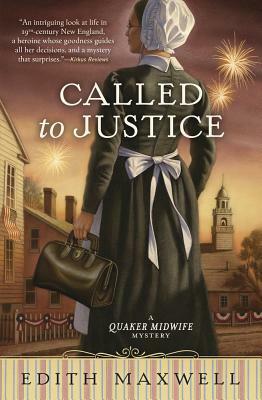 After a former slave and fellow Quaker is accused of the murder, Rose delves into the crime, convinced of the man's innocence. An ill-mannered mill manager, an Irish immigrant, and the victim's young boyfriend come under suspicion even as Rose's future with her handsome doctor suitor becomes unsure. Rose continues to deliver babies and listen to secrets, finally focusing in on the culprit only to be threatened herself. Edith Maxwell is President of the New England chapter of Sisters in Crime and a long-time member of the Society of Friends. She is the author of the Local Foods Mysteries and writes the Country Store Mysteries under the pseudonym Maddie Day.